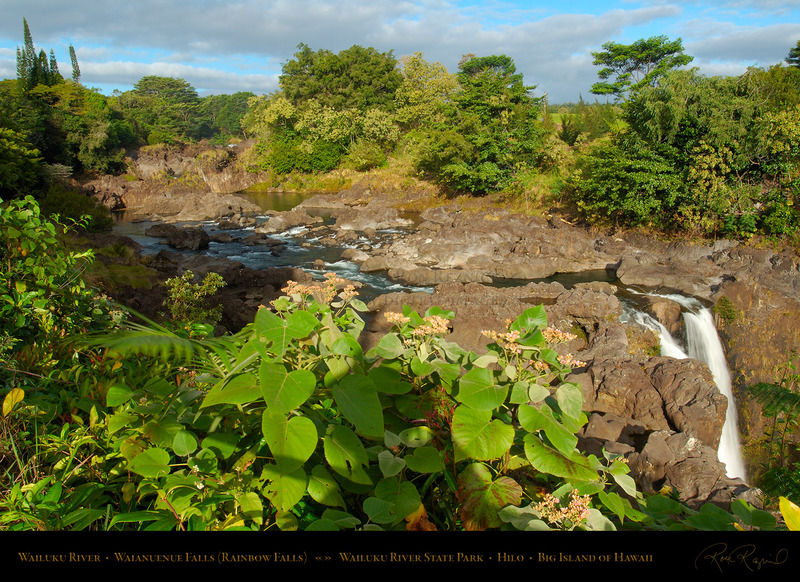 Kilauea, the Puna Coast, Waianuenue Falls, Pu'uhonua o Honaunau and Liliuokalani Gardens. 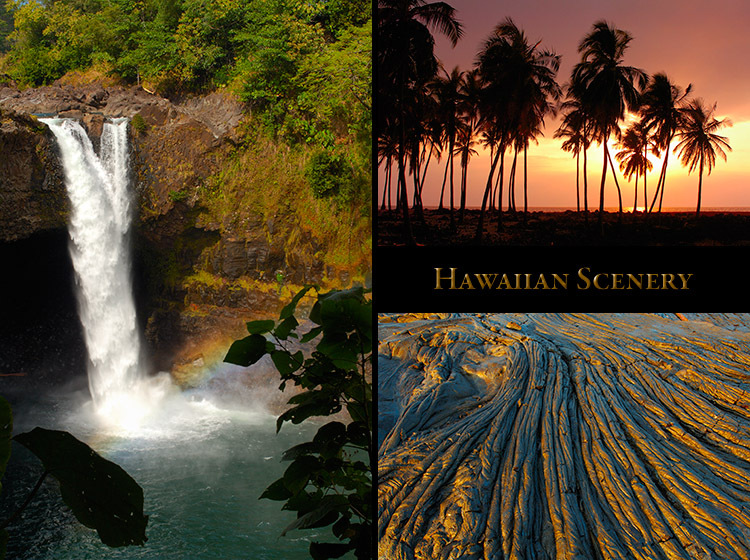 Click the banner above for the Hawaiian Scenery Gallery on Photoshelter. 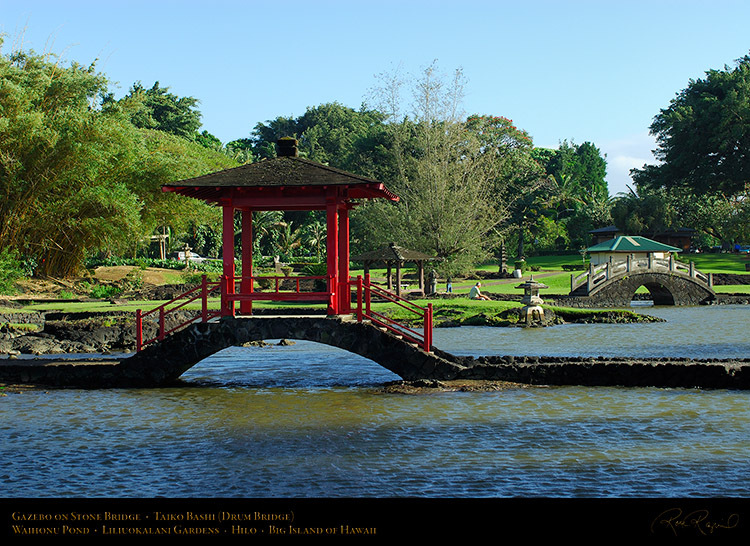 the royal mausoleum which housed the remains of 23 deified high chieftains and sanctified the place of refuge. The Great Wall at Pu'uhonua o Honaunau, the Place of Refuge on the South Kona Coast. haka haka (vacant spaces) method, stone rubble was used to fill the interior cavities. 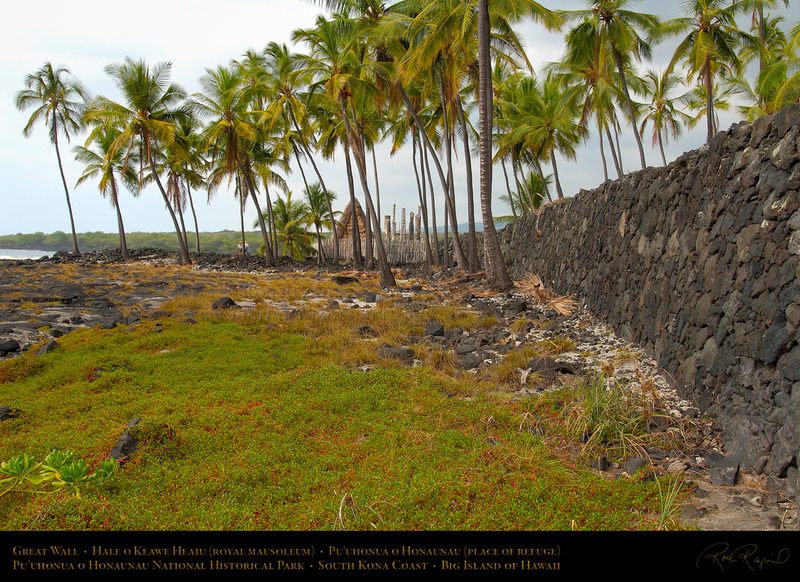 The Great Wall separated the royal grounds of Honaunau from the Pu’uhonua refuge. 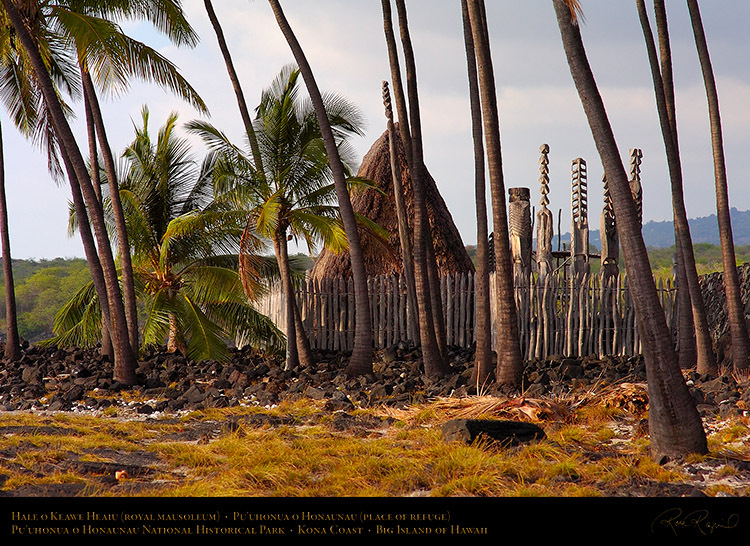 reconstruction of the Hale o Keawe (House of Keawe) Heiau, an important royal mausoleum. 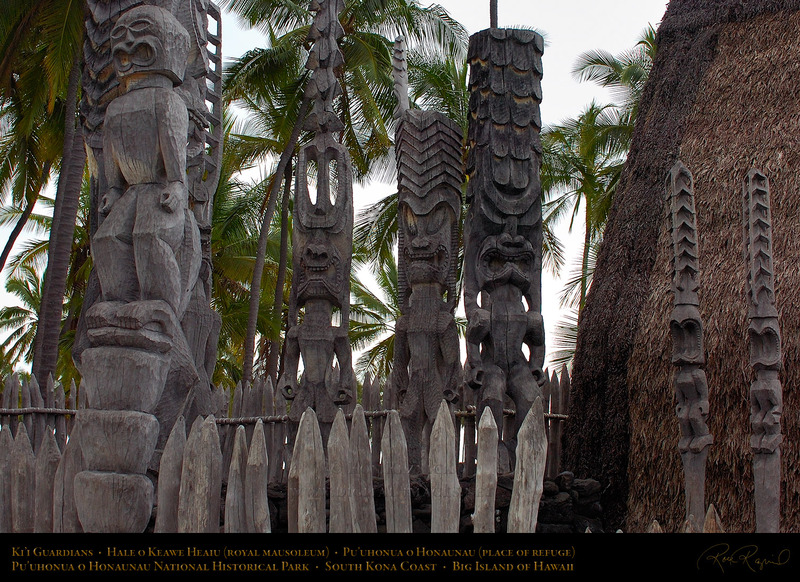 tsunamis of 1868 and 1877, and it was rebuilt (using an incorrect plan of four terraces) in 1902.
hale, wooden palisade and Ki’i (wooden figures). 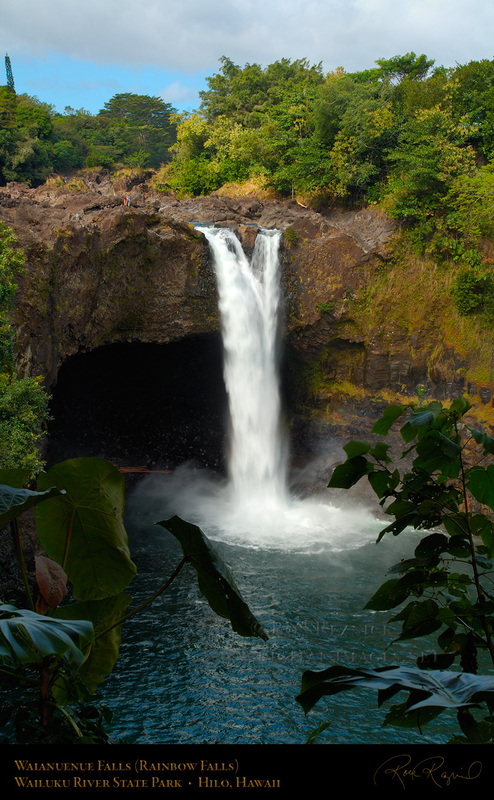 The hale and ki’i have been rebuilt twice. 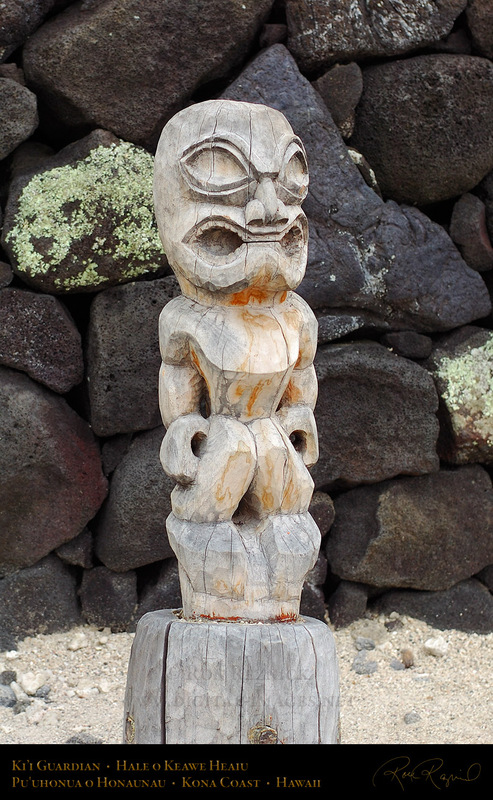 such as priests, sorcerers and magicians, crafts such as carving (in this case), healing, etc. 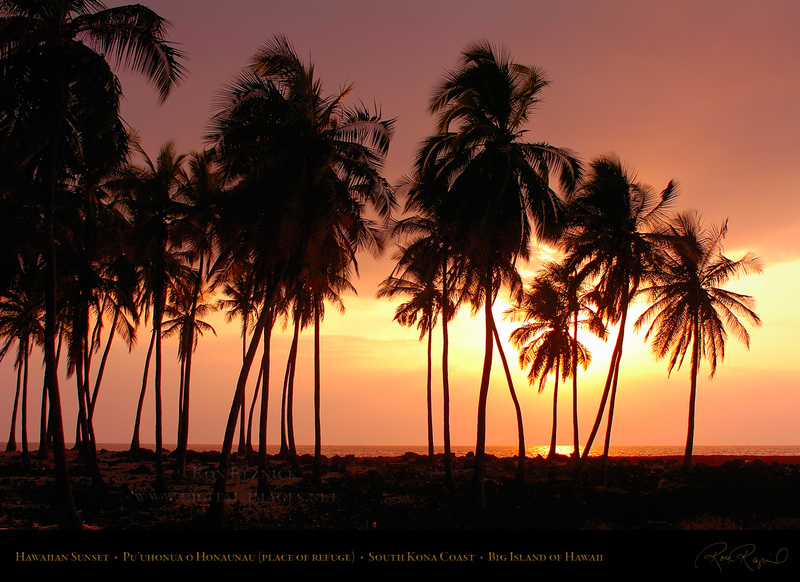 There were more than forty different types of kahuna, including ten types of sorcery kahuna. 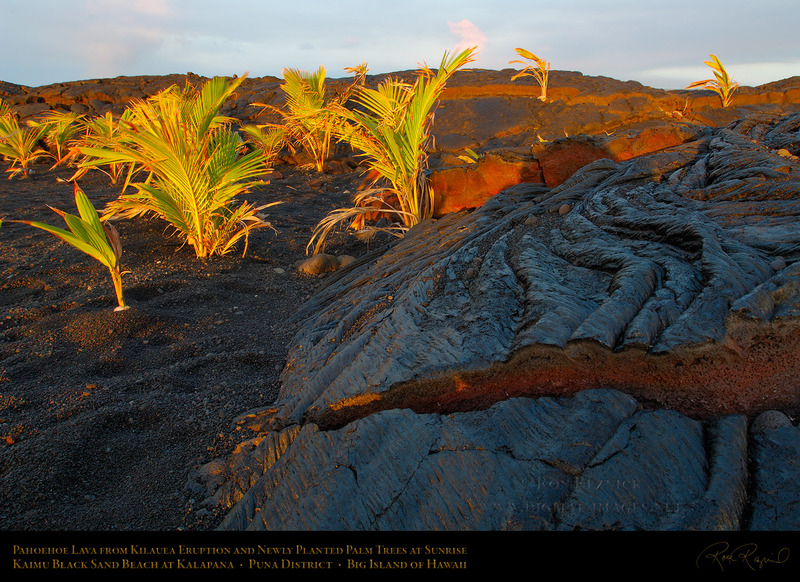 Ki’i stood around Hale o Keawe to warn visitors against defying the kapu (sacred law). 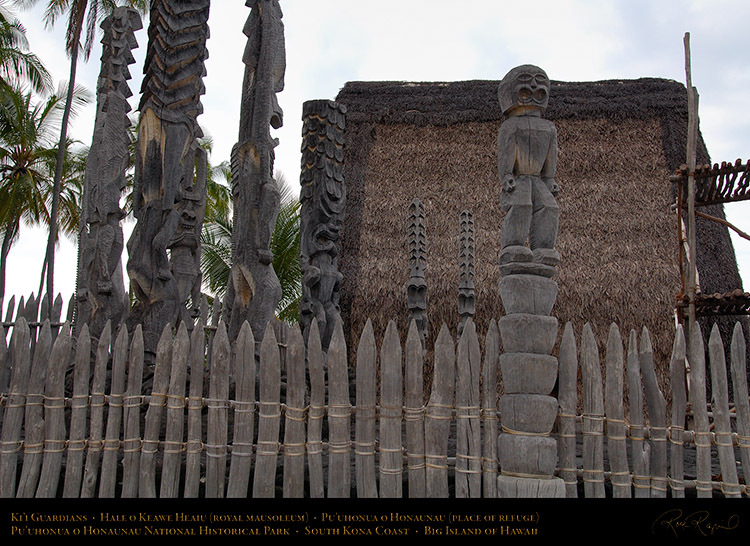 The ki’i guarding the entrance to the Pu’uhonua. 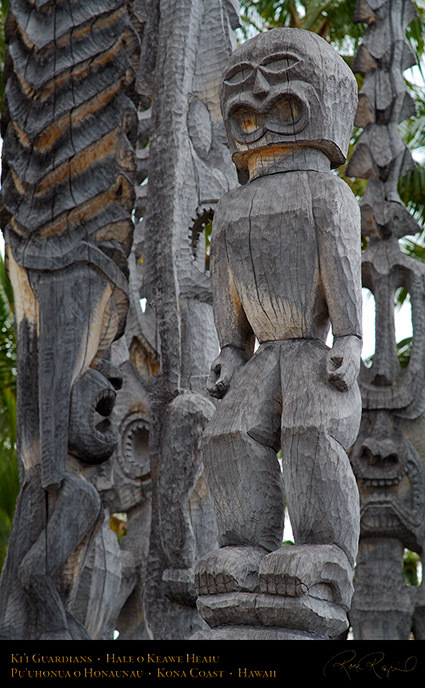 Detail of ki’i standing outside Hale o Keawe. royal mausoleum housing the bones of chiefs whose mana (divine power) sanctified the place of refuge. the royal grounds of Honaunau, on the south Kona Coast of the Big Island of Hawai’i. 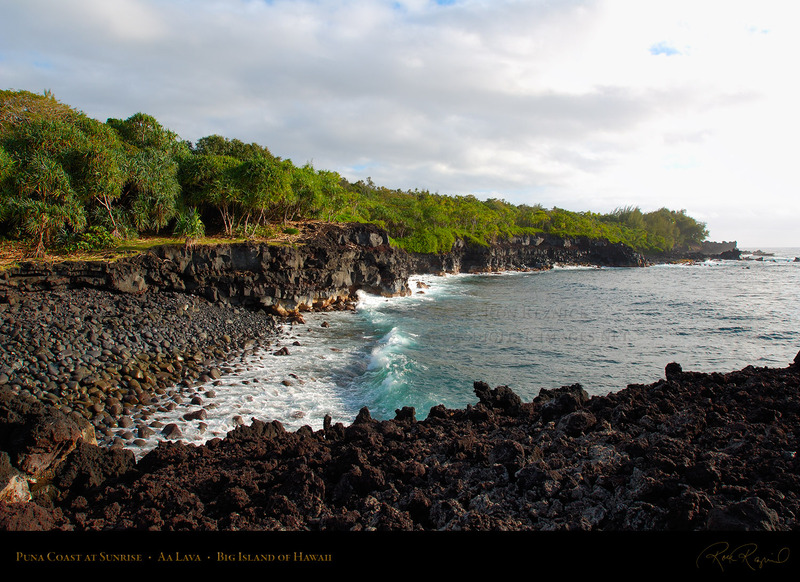 of 1990 which covered the town of Kaimu and its famous black sand beach under 50 feet of smooth lava. 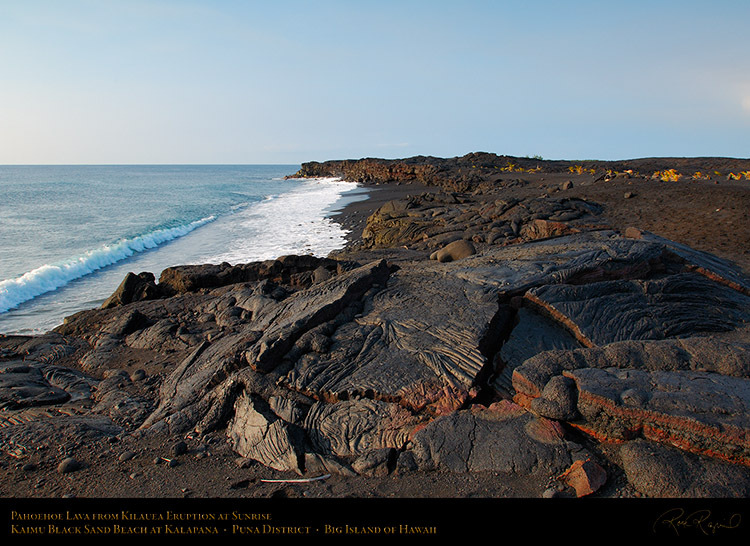 of pahoehoe lava extends to the new shoreline, where the crashing waves are creating new sand. Ropy Pahoehoe lava reflecting the rising sun at Kaimu Beach near Kalapana on the Puna Coast. which retain the heat and keep the viscosity of the molten rock low, allowing it to flow long distances. 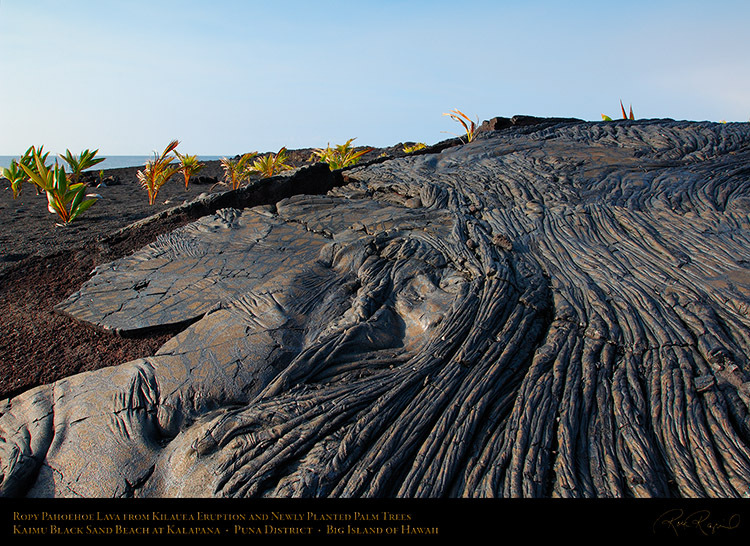 to the east in 1990 and covered the villages of Kalapana and Kaimu in 50-75 feet of pahoehoe. Pahoehoe lava on Kaimu Beach, showing the typical billowy lobes and ropy textures of smooth lava. 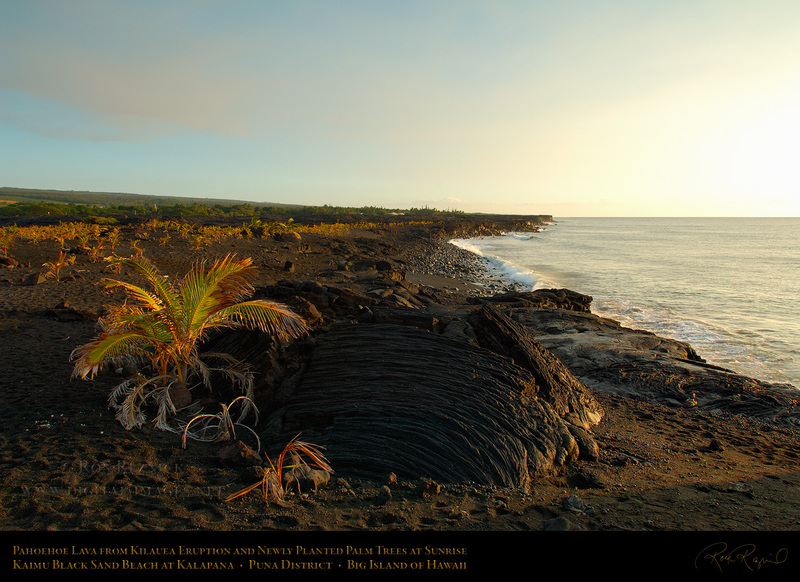 The sculpted surface of a Pahoehoe lava shield in front of newly planted palm trees on Kaimu Beach. 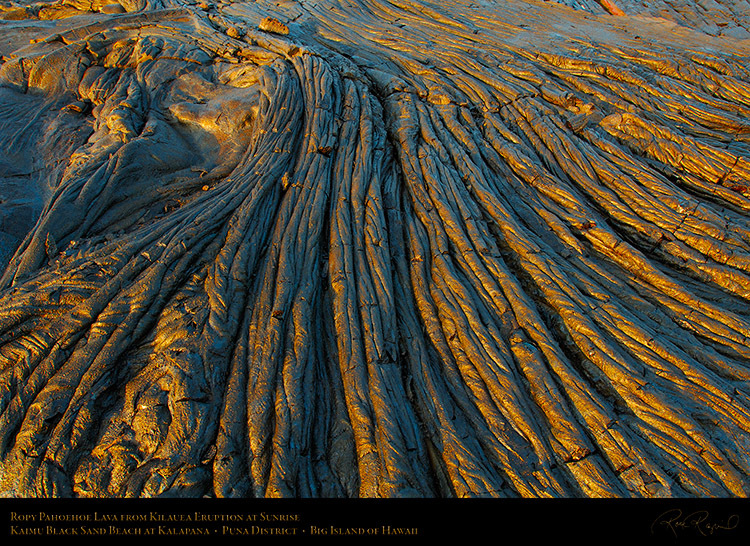 at Kaimu, near Kalapana on the Puna Coast of the Big Island, in the golden light just after sunrise. 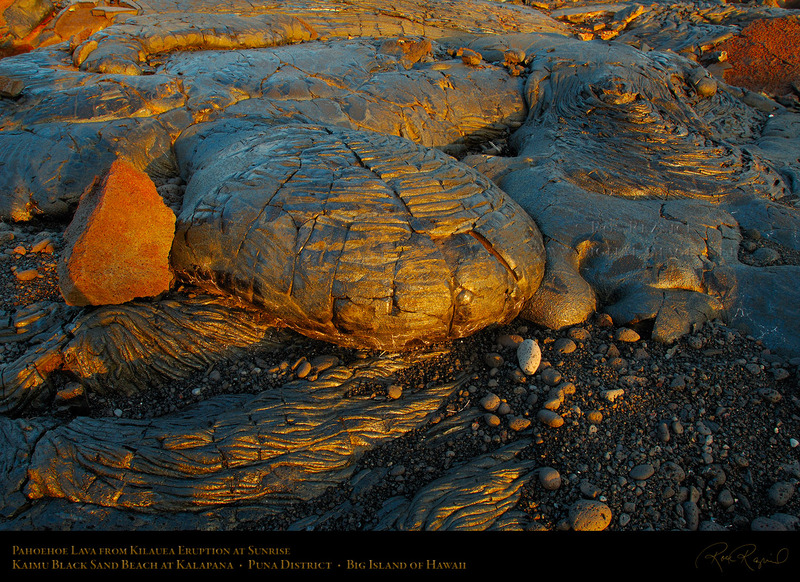 Fractured blocks of pahoehoe lava at the edge of the new black sand beach at Kaimu, just after sunrise. 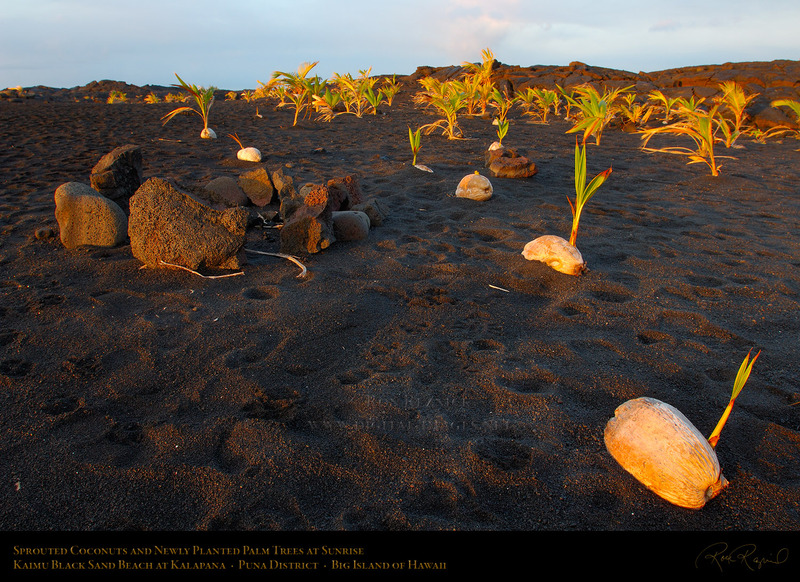 from the Pu’u O’o cinder cone of Kilauea volcano, at Kaimu Beach on the Puna Coast of the Big Island of Hawai’i. 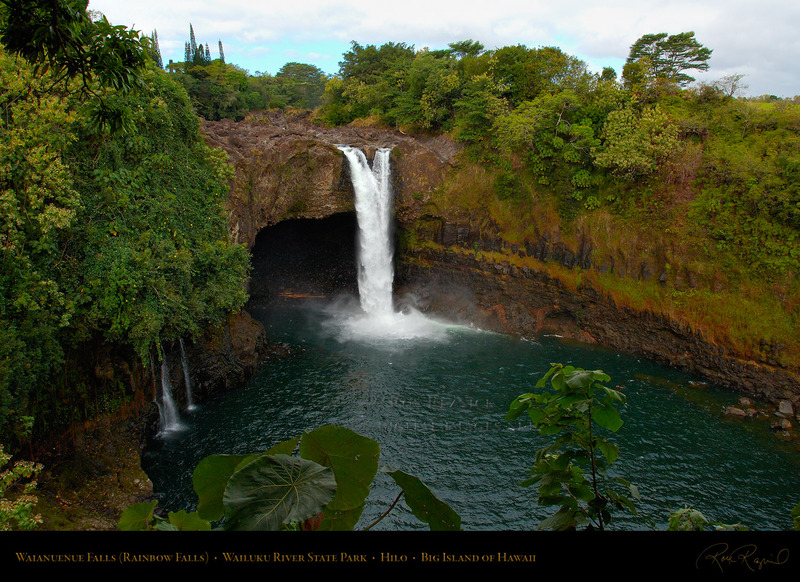 unknown to most visitors, and requires either a four wheel drive vehicle or a careful hike to approach. the 1801 eruption of Hualalai volcano (see the 3rd image). 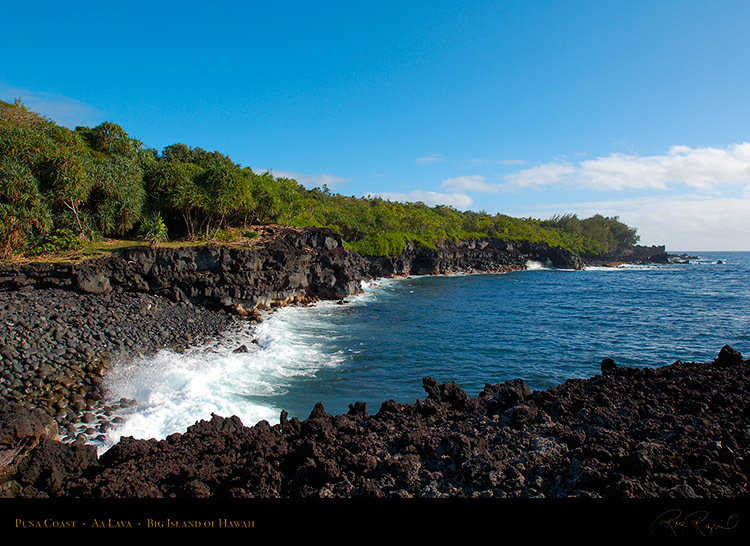 40 feet deep, it is surrounded by A’a lava. lose gas during the rolling motion of the flow, and form crystals not generally seen in pahoehoe flows. 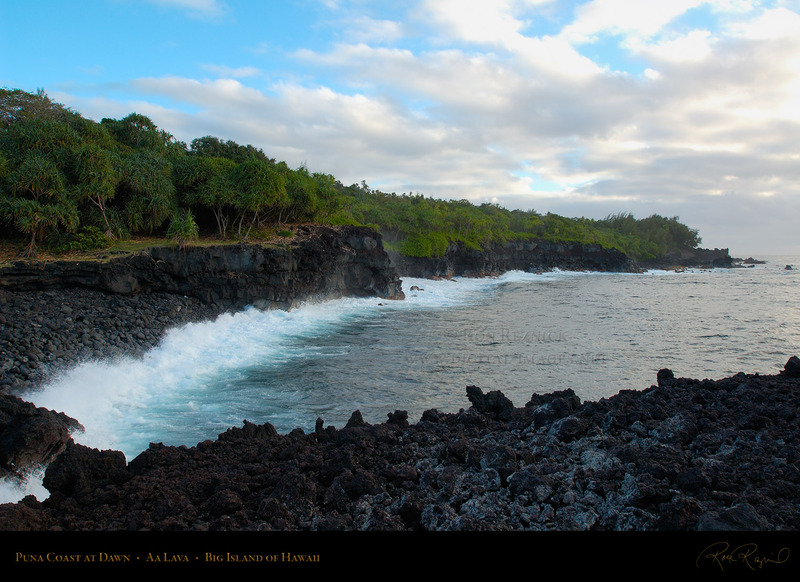 Hualalai volcano overlooking Makolea beach and rough, blocky formations of Aa lava on the Kona Coast. carried on top of the flow remain as a surface when the core solidifies, forming the sharp spiny A’a exterior. 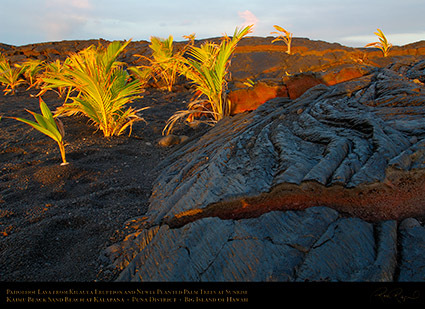 A’a lava and the Puna Coast at dawn. Above are the two available dawn shots showing different wave positions. and is densely forested. 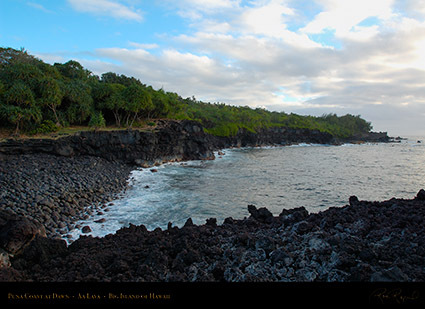 The rugged shoreline of the Puna Coast is east of Hawai’i Volcanoes National Park. 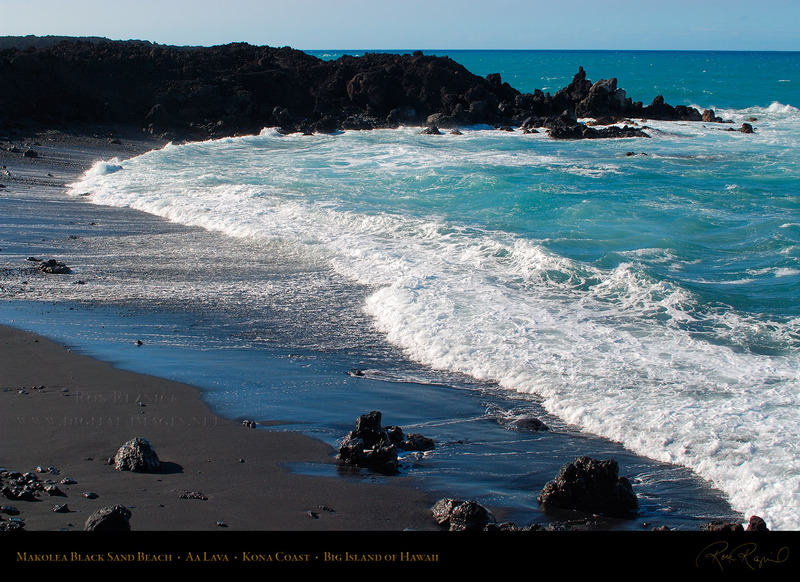 about 5 miles to the northeast of Kaimu Black Sand Beach (which was shown at the top of the page). One of three available shots taken about 45 minutes after sunrise (showing different wave action). 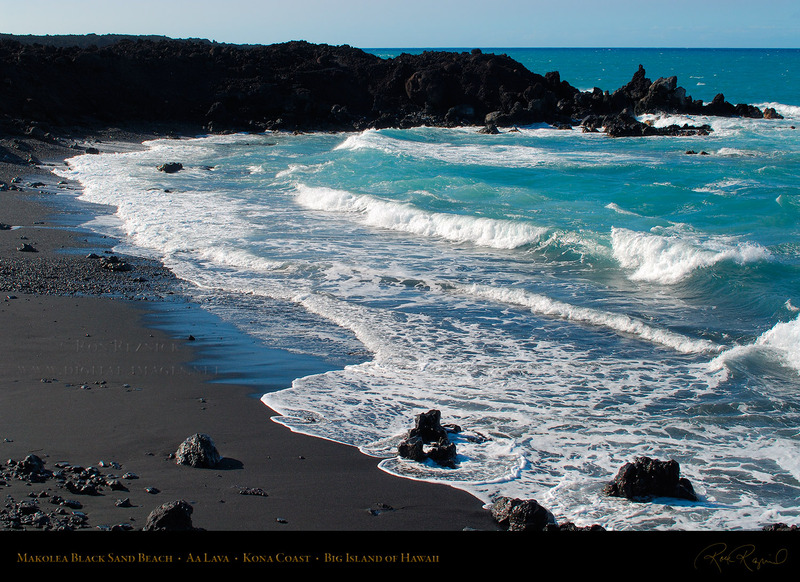 the ocean. Note that the forested area nearly reaches the cliffs, and distant foliage overgrows the cliff edge. 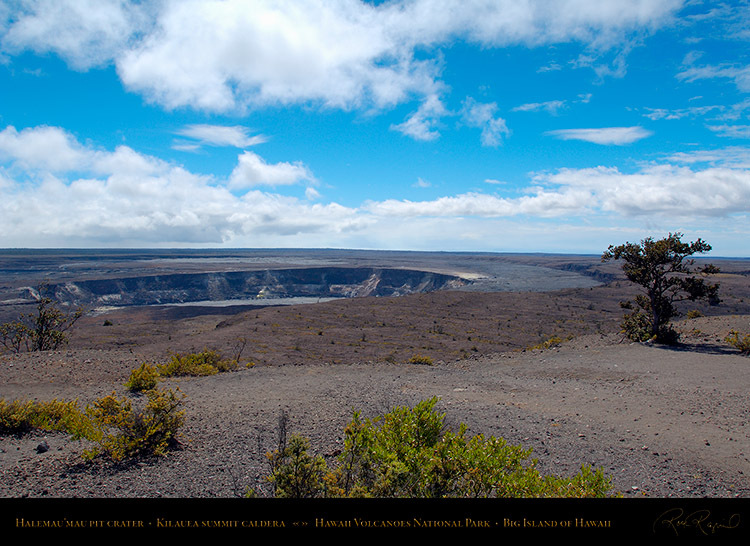 can be seen about halfway up the crater wall marks the high point of the lava lake from the 1967-68 eruption. her brother stopped her from digging so she would not reach water and put out Pele’s fire. Colorful story. caldera, accompanied by explosive eruptions. This is a far more unlikely possibility than Pele and Hi’iaka. 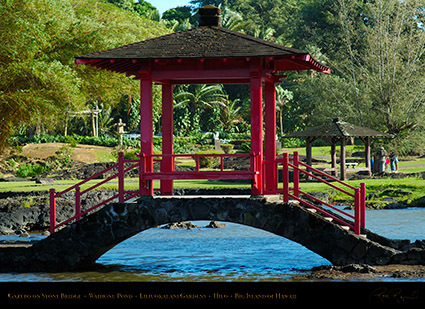 outside of Japan, built in the early 1900s. 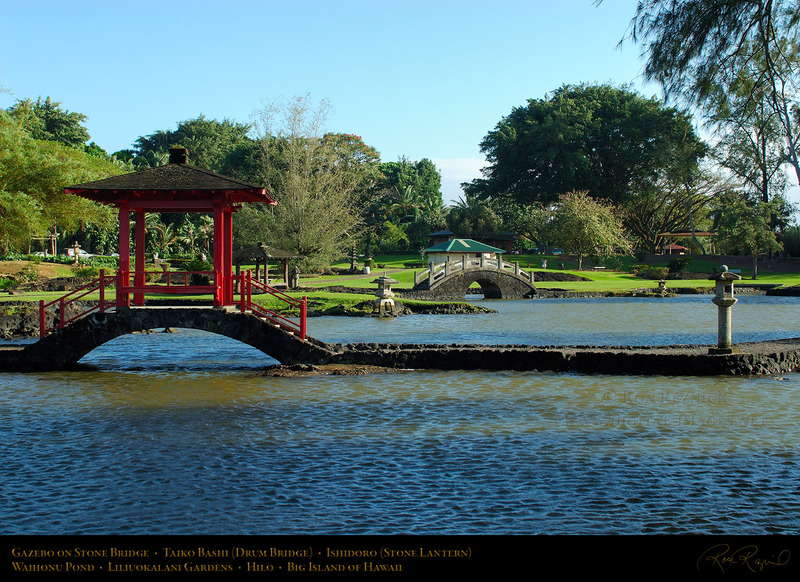 These pictures show Waihonu Pond and its bridges and lanterns. the same wealthy business owners who had earlier disenfranchised the people. 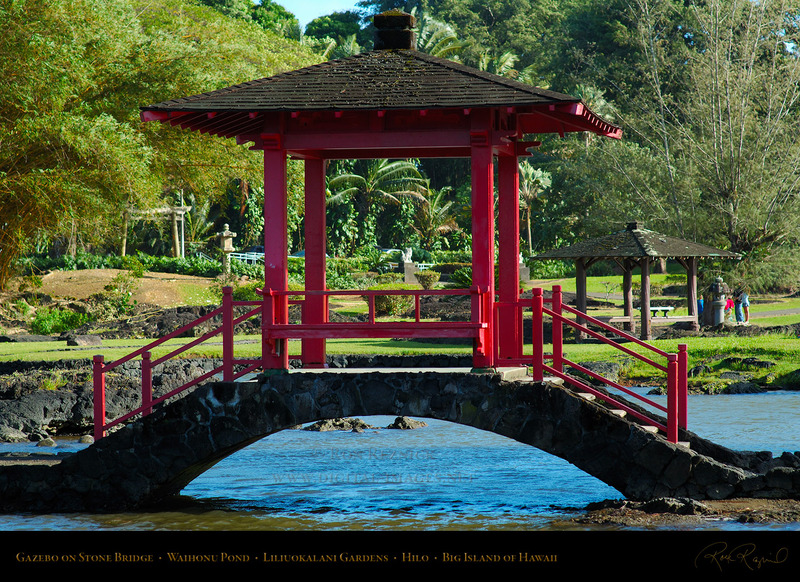 Liliuokalani donated the land upon which the park and gardens were created. plantations, it is the largest Japanese ornamental park built outside Japan. 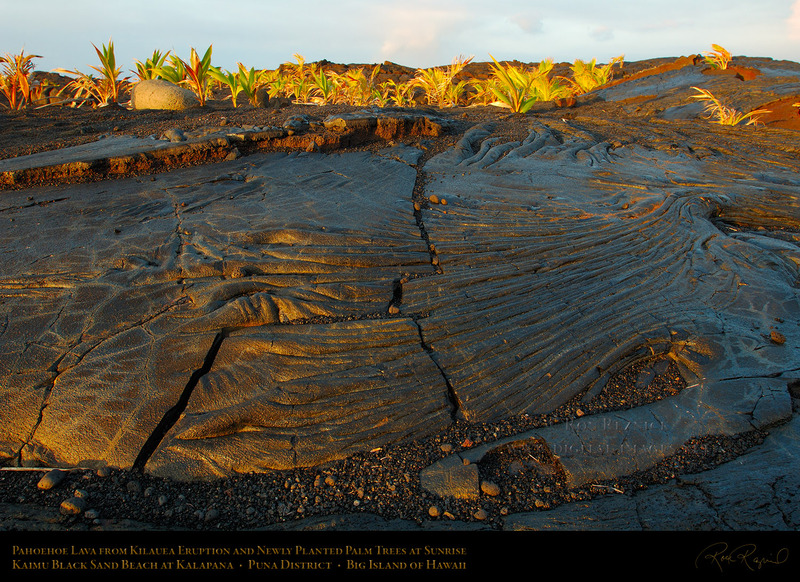 lava flows from the two volcanoes, entering the Pacific Ocean at Hilo. 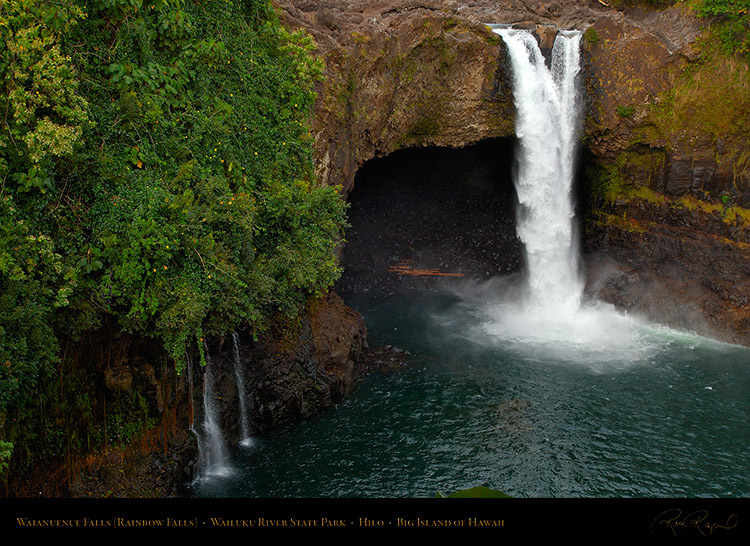 The name means River of Destruction. from the area which is shown above, and then over an 80 foot precipice at Waianuenue Falls (Rainbow Falls). 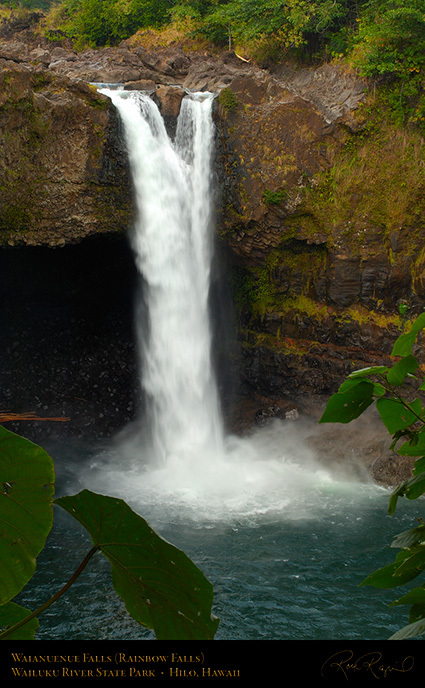 Waianuenue Falls (Rainbow Falls) tumbles 80 feet into a blue-green pool a few miles above downtown Hilo. The falls flow over a natural lava cave, the mythological home of Hina, the Hawai’ian goddess of the Moon. Hina is the oldest of the goddesses, and is known all over the Pacific Islands, having many other aspects. over the other. 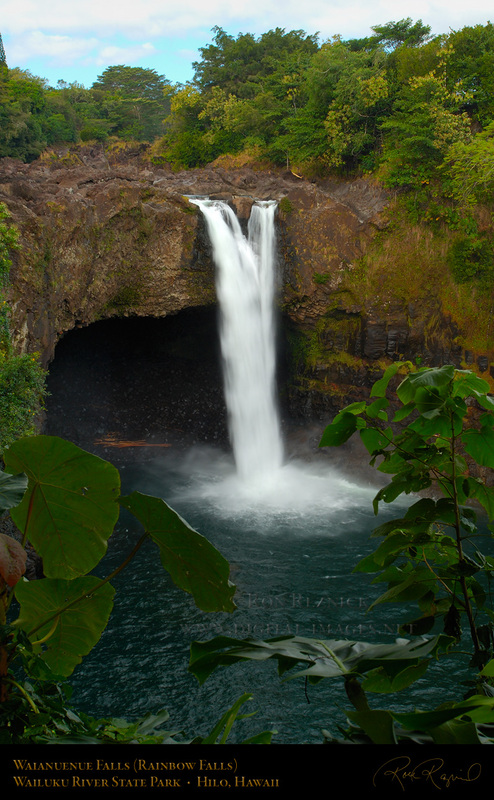 Portraits with slower speeds are next to images with faster shutter speeds for comparison. There are also two 4:5 aspect ratio images available: 434 is like 433 but cropped 4:5, and 446 is like 447.
the pool is blanketed by lush tropical rainforest vegetation, and wild ginger grows around the edge of the pool. The sun peeked out long enough for a small rainbow to form in the mist below the falls, seen in this higher speed image. 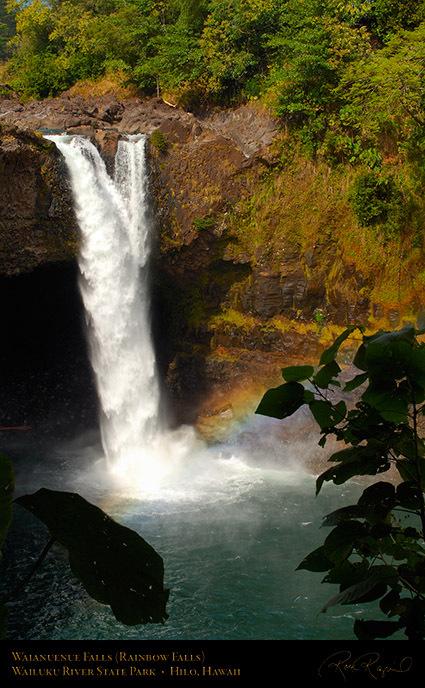 Wainuenue (Rainbow) Falls above downtown Hilo, in a slow speed image (1/20 second vs. 1/80 second at left).